In the last decade, engineering ethics has gained increasing attention in most undergraduate engineering curricula in Europe and the US. This requires methods that go beyond the traditional classroom settings and help students see multiple perspectives surrounding an issue rather than only a technical one (Maier et al. 2007: p. 1162). It is increasingly recognized that active learning pedagogies (i.e., learning by doing) are more effective for promoting these student competencies (Prince 2004). In a review of different active learning approaches, Prince found that students working in small groups on real problems, and with mutual interdependencies, contribute to a more enduring and sustainable remembrance of the content that was delivered by teachers. Additionally, these active learning approaches also have a positive influence on student attitude. These activities are best combined with individual responsibility and coupled with explicit instruction in these skills (Springer et al. 1999). In this paper, we focus on role plays, which can be used in combination with and additional to more traditional forms of teaching. In engineering, role plays have already been used successfully to teach students environmental issues and sustainability (Guikema et al. 2001; Maier et al. 2007), to develop professional skills (Cooley et al. 1991) and responsible conduct (Fischer and Zigmond 2001; Brummel et al. 2010), and to improve students’ capabilities for recognizing ethically relevant issues in engineering, including awareness for decision making in an organizational context (Van de Poel et al. 2001). In this paper, we present some learning experiences from a role play based on a historical case in the Netherlands. The case concerns the organization of the inspection of pig transport. Data of this case was made available by the Safety Science group of the Department of Technology, Policy, and Management (TPM) of Delft University of Technology (DUT). The focus in the case is on the institutional factors and political interests pertaining to the inspection and regulation of the pig sector. The role play presented in this article is used in the mandatory course “Ethics, technology, and responsibility” for second-year Bachelor students. Similar to other DUT courses, the course content is focused on the prospective engineers’ responsibilities in their future professional practice and the objective is to help students conduct a solution-oriented debate about such problems against relevant backgrounds (ethics, law, professional codes, historical developments, and responsibility in and of organizations). The course is aimed at recognizing moral problems in professional practice and to be able to reflect on them using the conceptual frameworks offered by the course. The setup of the course reflects these two main learning goals. In the course of 7 weeks, the students weekly attend a 2-hour tutorial session. The first hour is spent on theoretical perspectives like the different meanings of the word responsibility and different ethical methods. The second hour is dedicated to practical cases, reflecting real life and all its complexities. These practical cases turn out to be highly motivating, since they are based on real-life stories and events. The practical focus of the course is further strengthened by inviting external guests to provide a lecture during the course.1 The tutorial series is concluded with the role play. 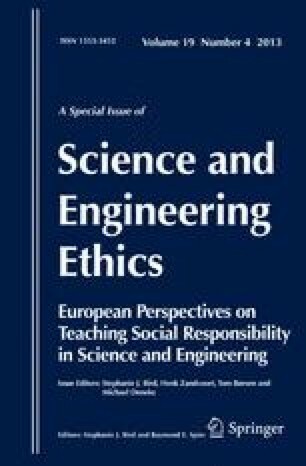 With the discussion of this role play, we hope to contribute to the growing body of engineering ethics literature, with the ultimate aim of “empower[ing] students for positive contributions to reshaping or reforming the social, economic and legal context of engineering” (Conlon and Zandvoort 2011). The assessment of the role play itself is explorative in nature. Since the play has only been enacted a few times, we do not have a quantitative analysis yet. On the basis of the first experiences, combined with student evaluations from previous courses, it is possible to draw some conclusions on this particular role play. The outline of this paper is as follows. Following this introduction, we first discuss the current criticism on the individualistic approach on engineering ethics. After briefly discussing a rough taxonomy of objectives of role plays, we discuss previous experiences with role plays at universities (both in general and at DUT). After that, we discuss the Dutch pig transport case and the role play that is based on this case, including four evaluative dimensions that are part of the role play instructions. In the subsequent section, we discuss our experiences and some points for improvement. The paper ends with a concluding section in which we summarize our findings. The terms “micro-ethics” and “macro-ethics” were originally coined by John Ladd (1980) and they are taken up by others in the context of engineering ethics (e.g., Hudspith 1991, 1993; Herkert 2001; Herkert 2005). Whereas the focus of micro-ethics is on relationships between individual engineers and their clients, colleagues and employers, the focus of macro-ethics is on the collective social responsibility of the profession. Herkert (2001, 2005) argues for a broadening of engineering ethics education by integrating the micro-ethical and macro-ethical perspective and to link individual, professional and social ethics. As an initial agenda, he proposes a multidisciplinary approach, in which ethicists, STS scholars and teachers develop case studies with transparent links between public policy, professional societies and engineering codes of ethics. Although different authors have different foci, we can establish that many authors point to the broader context of individual decisions, whether they call this the institutional context, macro ethics, or some other name. This larger context frames the individual decisions of engineers. Taking a moral decision within such contexts therefore assigns the individual engineer with an optimization effort. Rather than the individual judgment of the engineer involved, the communicative process by which the engineer succeeds in influencing these force fields around her make the difference. In this respect, enhancing communicative competence of engineers is an important issue (Ravesteijn et al. 2005). Personal judgments are not unimportant but need to be backed up by the ability to create support for these judgments within this larger institutional framework. From this perspective, it appears to be necessary to put more emphasis on the social interaction necessary to attain cooperation and to reach institutional backing. As described in the previous section, the traditional “individualistic approach” to engineering ethics is increasingly criticized for being too narrow and simplistic in its depiction of the engineering practice. It is by now realized that role plays are particularly useful for teaching these broader and contextualized aspects of ethics. The arguments provided in support of role plays often refer to the fact that they mimic real life situations (Raisner 1997) and the fact that they engage the students in a process of ethical inquiry which is immediately comprehensible (Brown 1994). According to Brown, three factors particularly contribute to the success of role plays. It allows students to: (1) achieve insights into themselves; (2) clarify their values; and (3) direct or change their behavior (Brown 1994). If carried out in a safe environment, role plays allow for the exchange of extreme views without “preaching” by the instructor (Raisner 1997). In this section, we provide a brief overview of the experiences at other universities with role plays, followed by a discussion of the experiences at DUT. broadening students’ perspectives (this includes macro-ethics). Although these objectives are not mutually exclusive, most role plays have a primary focus on one of the three objectives. Teaching communication or social skills with role plays is maybe most common in clinical and counseling professions, where students need skills to discuss delicate (health-related) issues, take an anamnesis, or explore people’s hidden motives (Garvin and Stefani 1993; Ahsen et al. 2010; Bosse et al. 2010; Hahn et al. 2010; Kopecky-Wenzel and Frank 2010; Paskins and Peile 2010; Schellhorn and Possl 2010). Teaching communication skills by way of role plays is also common in journalism (Brislin 1995), commercial service (Frash et al. 2010) and consultancy settings (Dixon and Jagodzinski 2003; Baruch 2006). When these dialogical settings are explicitly aimed at discussing (micro-)ethical issues, the primary focus shifts from process to content. Research ethics (or scientific integrity; both terms are used more or less synonymously), for example, is often taught by simulating a meeting with the Institutional Review Board or ethics committee (Rosnow 1990; Johnson and Corser 1998), or even civil court trial (Cooley et al. 1991). However, not all topics can be framed as a discussion where students have to give an account of their behavior. In those latter plays, the focus is more on raising awareness for particular ethical problems rather than taking a position (Doron 2007). As a third objective, we could distinguish role plays aimed at making students aware of the different perspectives to a particular problem or the different issues that are at stake (including macro-ethical issues). In these role plays students learn about the legitimacy, and sometimes urgency, of other people’s perspectives that are not always included in the decision making process (Applegate and Sarno 1997; Raisner 1997; Guikema et al. 2001; Lloyd and van de Poel 2008). These plays often simulate a negotiation or decision making process. They are mostly used in business and engineering because people working in these professions are often confronted with complex multi-stakeholder situations. In most role plays mentioned, the students not playing one of the “roles” are explicitly asked to observe the play and to provide feedback. Participants sometimes even label the discussion as more valuable than the role play itself (Brummel et al. 2010). While not surprising, this is an important observation to take into account. It is questionable whether role playing without a proper evaluation can fulfill its learning objectives. We therefore think that any role play should include a systematic plan for observation and providing feedback, preferably to be done by the students themselves. Ever since the DUT board’s decision to introduce compulsory courses on ethics during the final stage of the curricula of all engineering programs, the Philosophy group of the Department of TPM has been responsible for developing and teaching such courses. From the start in the mid-1990s, this task has been carried out in close consultation and cooperation with the engineering departments for which the courses are intended. During the courses, cases are used as a central starting point to discuss the ethical aspects of engineering (Van de Poel et al. 2001: p. 273). Most courses work with lectures and tutorials in which the theoretical concepts are further discussed. The objective of the tutorials is to apply or relate the theoretical material from the reader to specific issues and cases documented in the workbook (Zandvoort et al. 2008). In most courses, a role play is used to further illustrate the ethical dilemmas that prospective engineers may face when working in organizations (objective 3 in classification presented in the previous section) and, as a secondary aim, to train the deliberative abilities of the students (objective 1). One role play that is widely used in the DUT ethics courses is based on the Challenger disaster (1986) (see Vaughan 1996) for a detailed analysis of the disaster). In this role play, students are faced with the dilemma of making sound moral judgments under time pressure in a situation of scientifically ambiguous information. The play was developed by Dr. Michiel Brumsen, who at that time worked at the Philosophy group. The play has been played many times and it is in general well appreciated by the students. However, since the outcome is known beforehand, the in-retrospect “correct” decision not to launch unavoidably sets a standard for the discussion. This gives the play a slightly clinical aspect allowing the students to apply the ethical concepts taught during the course in a rather academic, detached setting. A more serious point of criticism comes from course instructors with a professional experience in industry. After moderating the play, they pointed out that group management decisions are not only made on the basis of the technical input from experts but also by that of non-experts whose input is colored by earlier personal relationships with the experts in the group, creating higher or lower levels of blind confidence in their colleagues. Personal relationships of trust and distrust, like and dislike, significantly affect moral decisions and may change the outcome of the deliberations (Kroesen and Van der Zwaag 2010: p. 229). These aspects are not well developed in the Challenger role play as designed and used at TUD. In response to these points of criticism, one of the senior staff members of the Philosophy group together with one of the professors of the Department of Aerospace Engineering developed a new role play about a risky maiden flight with a newly developed composite airplane (the play is called “ToFlyOrNotToFly”). In the new role play, the outcome is not known beforehand and more emphasis is put on the performance and the quality of the social relationships among the actors. This play is well-received by students and tutors. It appears that relationships of loyalty or distrust, friend or foe, manipulation or authenticity do indeed affect the content of the final decision making process (Kroesen and Van der Zwaag 2010: p. 227). The role play described in this paper takes a step further by making the development of an organizational framework to improve responsible behavior as the explicit goal. Whereas the previous role plays both illustrate the organizational constraints that people working in organizations are faced with, the new role play aims at developing an organizational framework such that it facilitates rather than hampers responsible action. The role play presented in this paper is developed on the basis of existing material on the development of a Dutch governmental controlling body for Food and Consumer Product Safety (in Dutch: Voedsel- en Warenautoriteit; VWA). Recently, this body came under severe criticism for failing to inspect the meat industry. At the background of this criticism are the changed views concerning regulation of the sector. Whereas the VWA originally carried out inspections directly, it evolved into a second-line inspection body, with self-regulation in the sector being the working principle and the VWA acting as a kind of “inspector of the inspectors.” The role play presented concerns the political and social discussions that arose in 2007 around irregularities in the transport of cattle. The case got moving by a whistle blower from the Department of Agriculture, Nature and Food Quality (in the remainder: Department of Agriculture). The discussion gradually turned into a political debate on inspection versus self-regulation in the sector. The Minister of Agriculture was called to account in parliament and asked to introduce “measures” that would partly mean a backward step in the development towards increased self-regulation in the sector. In the role play, the case is simplified to a decision-making process about the role of the VWA in the inspection of the pig farming industry and the way to set up an institutional framework for responsible action. In the full case, several moral values and dilemmas run together: the conflict between societal and farming interests, societal costs versus commercial viability of farming, animal welfare against veterinary conditions, market function versus governmental regulation, simplified regulation versus increased cost price, trust in governmental bodies, etc. Responsible action, in such a context, refers to an adequate way of handling these conflicting values, without sacrificing the public interest (including the interests of minority groups). The institutional framework refers to the way the institution’s responsibility is organized such that it allows individuals to act morally (or at least, that is does not constrain individuals in behaving morally). Although, at a superficial reading, one may argue that the case is—strictly speaking—not derived from (prototypical) engineering practice, it seems a very suitable case for teaching engineering ethics. First, in many sectors, inspections have literally become a technical issue (in the sense of surveillance and monitoring techniques), that need to be aligned to “soft aspects” (i.e., social, legal and policy issues). Second, the case is about the organization of inspection of a particular farming sector and the different responsibilities that pertain to this inspection. It herewith makes the creation of an institutional framework for optimal moral conduct explicitly part of the deliberation simulated in the role play. Third, the complex socio-technical setting involves different meaning giving perspectives from other stakeholders involved in the process. These other stakeholders do not only judge the situation differently, but they may also frame and name the situation differently, which may complicate the decision making process. After all, ethics involves different and competing sets of value priorities, which may be hidden behind these different meaning giving perspectives. It is important for engineering students to recognize that these different dimensions are omnipresent in engineering practice (as probably in any professional practice; cf. Bucciarelli 2008). Although the full case is, for practical reasons, simplified to a more concrete decision, the underlying values and dilemmas are still the same and, as such, the role play still largely reflects the complexity of the real case.4 In the role play, the key question is about how to shape the VWA’s responsibility in the inspection of meat production, involving both the transport of animals and the slaughtering. In the imaginary deliberations that are simulated here, the Minister of Agriculture wishes to make a last attempt at working out a proposal together with the pig sector, with inspection of meat production being regulated by the sector itself and with the role of the government receding to the background. In view of all the fuss in the media and politics in the past year, however, this should be a proposal in which both food safety and animal welfare are guaranteed. She must also be able to defend the proposal in Parliament and she must therefore avoid having a parliamentary majority against it. At the end of the role play, she has to decide whether or not she will accept the proposal and defend it in parliament, facing the risk of either disproval by her own Christian Democratic party and the liberal party in case she rejects the proposal or a vote of no confidence in case a majority of the political parties in Parliament is against the proposal. The role play consists of two rounds. In the first round, representatives of the pig-farming sector and the VWA come together to work out a proposal. In the second round, one of the participants must defend this proposal to the Minister of Agriculture and the Standing Parliamentary Committee on Agriculture. Various parties are represented in the standing committee, with diverse interests. Will the pig sector succeed in creating a proposal that will be acceptable to all the parties? Students not playing a role in the game are divided into four groups of observers and required to take notes and analyze the conduct and argumentations of the players. These groups report their observations on four different dimensions of the communication process, derived from the learning goals of the ethics course and especially the learning goals of role games within the framework of such a course on ethics. These dimensions were: the normative, performative, informative and responsibility dimension respectively. Reporting on the normative dimension (the expressions which appeal to norms and values in the discussion) shows whether students can recognize ethical issues in the discussion as ethical issues. To report on the performative dimension (this refers to the performance of the participants in the discussion, their authenticity, credibility, the impression they make or try to make, and by which they either are open to or manipulate their opponents) is related to the learning goal of exercising the communicative skills of the students, an important learning goal of role games in general. The students can be shy, or stubborn and aggressive, or not open and authentic. Failing in such abilities to articulate and communicate seriously affects the (moral) quality of the decision taken. The students are invited to reflect on the effects of their behavior. Reporting on the informative dimension (referring to the clarity and consistency of the information presented and disseminated) is related to another important learning goal in courses on ethics; viz. the ability of sound reasoning. Finally, the responsibility dimension (referring to the question whether the participants meet sufficient standards of responsibility in giving shape to their character) involves a moral judgment on performance and result, preferably from the perspective of moral notions and theories taught in the course. These four evaluation dimensions were already developed in the ToFlyOrNotToFly role play (for a more detailed description of these dimensions, see Kroesen and Van der Zwaag 2010). Upon the termination of the game, the observers report their findings and the players in the role play will evaluate their roles and the outcome of the game. It can be analyzed and explored whether a different outcome would have been the result, if some of the players would have acted differently either on the normative, performative, informative or responsibility dimension. Questions can be asked like: Have the norms at stake been made clear? Have they become explicitly part of the discussion (something which usually reinforces them)? Could the participants have performed better in terms of open communication? Were they authentic, listening, or using rhetoric, bullying even? And what was the effect of all that? The role play has been enacted three times since 2010 and the plot and the role descriptions have been readjusted on the basis of the experiences gained. After finishing the course, the students were asked to evaluate the role play on the basis of a questionnaire (see Table 1). 1. What do you think was the objective of the role play and did it attain this goal? Please specify your answer. 2. What did you find instructive about the role play? 3. What are the points of improvement regarding the role play? 4. How does the role play fit in the lecture series? Is there sufficient coherence with the teaching material? If not, please specify. 5. How do you assess the four evaluative dimensions (normative, performative, informative, responsibility); did they contribute to a better understanding of the course of the play? 6. Please give a grade for the role play on a scale of 1–10. On the basis of both oral and written student evaluations and evaluations with the tutors involved the following points can be identified. In the first several plays, it turned out that the role play is rather complex. It is therefore important that the students are given the roles some time in advance, so that they can prepare well for the actual play. It is also important to provide the students with a clear structure that supports the decision-making process and also clear information about what the ultimate goal of the decision-making process is. A second important discovery is on the level of performance. Students are often completely unaware of the role and impact of their performative behavior. It often comes as a complete surprise for them if it is made explicit by their peers. Statements like “Whoever dares to ask for even more regulation, is a lunatic!” or “Don’t be so stupid to think that the farmers will take care of these matters themselves” are only recognized as having a performative effect at the moment they are reported back by the observers as showing a lack of openness and as attempts to intimidate the opponent. The discovery often prompts much laughter, since the students look at themselves in a new light. In this role play, many different perspectives are involved and the discussion may often become confusing. It is therefore an important learning experience for the participants to be made aware of this performative impact of their behavior. A returning discovery on the informative level is the point to what small degree factual information actually affects the final results. Frequently, when students get a case presented and have to make a judgment for or against a particular solution, they first ask for more facts. If they would only have a complete overview of all the facts, then they would derive from that the right conclusion, they feel. Via a role play, even more when it reflects a real political issue of the time, they discover that bare facts have little impact on the discussion conducted and decisions made. In addition, also in the real world, decisions are often taken on the basis of fragmentary information and under time pressure. One student commented: “One would like to have more time to take an informed decision.” Decisions are often made not on the basis of rational argumentation, but by (sometimes negative; i.e. inauthentic, closed and dominant) performance and rhetoric. At the level of responsibilities, it becomes clear that it is one thing to have an individual judgment about the situation and another thing to assume responsibility at the moment it matters. Hard material interests, but sometimes even more roles and reputations to uphold, stand in the way of doing what the same people actually feel they should do from a moral perspective. It often helps to play such role plays twice. In the first instance, the participants will keep up appearances, make a good impression, try not giving in, etc. Oftentimes, they get stuck because nobody is preparing the ground for a common and acceptable solution (which is a learning experience in itself). In second instance, the group can be asked explicitly from now on to enter some serious negotiations in order to reach agreement. Serious negotiations mean: listening to other viewpoints as well and not only follow one’s own interests, but also to be responsible for the moral quality of the final result and therefore to be more open in the discussion for different viewpoints. Part of such a final result may be the creation of an institutional framework as a guarantee for morally responsible action. A preliminary conclusion suggests that the students are aware of the need of such a framework. In the current role play, for instance, there is not only a trade-off between safety and profit but also such hidden values as recognition for the pig farming sector and resistance to the ever-growing role of state authority in civil affairs. This has an impact on the positioning of the stakeholders (cf. the remark “We live in a civilized country, where these kinds of things are not allowed to happen;” or the remark “If we won’t impose strict inspection, those pig farmers will immediately make more mistakes”, which was countered by one of the farmers’ representatives with: “You should not talk about things you lack knowledge of”). In the evaluation, it was recognized by the students that successful implementation of an institutional framework requires support by the various stakeholders. However, it was also mentioned that the time needed to develop such a framework is significant. It was therefore not possible to elaborate this institutional framework itself. Some points of improvement concern the equal involvement of all students. Although in general being positive about each other’s performance, the students themselves realize that there are significant differences between the individual students, some being more dominant than others. For this same reason, one of the tutors recommended not assigning key-roles to very timid students. It is questionable, though, whether this is desirable. Education should not be selective in that sense, and it seems important to make the setting safe enough that also the more timid students feel free to actively participate in the discussions. On the other hand, if the chair of the meeting does not function at all, the role play does not give the participants a real learning experience either. It is difficult to find a right balance on the amount of data to be provided to the students. Although some background information is needed to get the play going, having too much information runs the risk of turning the discussion into a technical one. Since the engineering curriculum is already considered rather demanding, it is preferable to reduce as much as possible the amount of technical background information that has to be studied beforehand. As already stated, in many cases this is also more in line with real life situations. The advantage of having more than one round in the play is that it allows for more students to participate in the play, but also to make it more realistic. In real life, decisions often have to pass by different bureaucratic “layers.” However, there should be a clear connection between the two rounds. Without such a connection, the discussions in the second round tend to restart at the very beginning again. This was improved in the later versions of the role play. In this paper, we discussed the use of role plays in ethics education. We distinguished three main objectives. On the basis of a newly developed role play we illustrated how role plays can be used to broaden students’ perspectives. Role plays prove to be a powerful tool for making students aware of the different dimensions that frame a decision making process. The role play is special in that the discussion is about setting up an institutional framework for inspection of the pig meat sector (or more general: for responsible action) that goes beyond individual action. In this way the students discover that not only individual decisions may be right or wrong, but that the very framework within which a decision is to be taken may be more or less conducive to doing the right thing. In that sense, the role play serves a double purpose. It not only aims at teaching students to become aware of the different dimensions in decision making, it also encourages the students to think about how such a framework for responsible action might possibly look like. Evaluation of the role play suggests that the latter goal is ambitious but not unfeasible—it only requires sufficient time for enacting the play. In a second version, we simplified the institutional alternatives to be put in place by offering the students different scenarios to specify and elaborate. Several concrete proposals came to the fore and were discussed. With this role play we hope to have shown that role plays can be used not only for raising awareness (that is, the realization that collective responsible action goes further than individual action, in the sense that individual action is often constrained by organizational culture) but that they can also be used to encourage students to take a step further and think about how to construct an institutional framework more conducive to responsible action. We think that this macro-ethical perspective is an indispensable element of any engineering ethics curriculum. For many students, this macro-ethical perspective proved an eye-opening experience. In other ethics courses at DUT, this link with professional practice is realized by inviting staff from the engineering departments to contribute to the courses (either by tutoring working groups or by giving lectures). This course is one of the few courses where external speakers are invited to bring in the professional practice perspective. It should be noted that micro-ethics does not fully overlap with the “individualistic approach” to ethics. Whereas the individualistic approach focuses on individual choices, the focus of micro-ethics is on relations between individuals. However, the two approaches overlap in their neglect of the organizational (collective or institutional) dimension. The criticism directed at the individualistic approach to ethics is therefore partly similar to the criticism directed at micro-ethics. See http://ethicsandtechnology.eu/socialresponsibility/index.php (last accessed: November 1, 2011). In that sense, we think that the role play is only quantitatively but not qualitatively different from real life. Of course, the lasting effect of one’s decisions are different in case one makes a decision in real life (and similarly, the pressure imposed by one’s party may feel not as fierce as in real life); most students, however, show to be able to empathize with their role. Interestingly, when the ToFlyOrNotToFly role was discussed during a workshop for ethic teachers, the teachers also confirmed that playing the role makes one almost automatically empathize with their role and that they genuinely felt that the arguments in favor of their position were sound, also in case they played a role they beforehand did not empathize with. This suggests that people playing a role, will also feel responsible for the decision towards their own party.